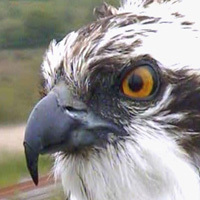 You are here: Home / Nature / Dyfi’s breeding ospreys. Nora, a female osprey has just laid her first egg at the nesting site at Cors Dyfi Reserve. This is the first time in 400 years that ospreys have successfully mated in the Dyfi valley. The hide and visitor centre has plasma screens showing live pictures of the ospreys. The centre is open throughout the summer and is only twenty minutes from us. Why not come and stay with us and use your time here to visit the Cors Dyfi Reserve and Ynys Hir RSPB reserve as seen on the new season of BBC’s Springwatch.